The Boy's team played in the State Cup this past weekend. They went 1-1-1 for the weekend. 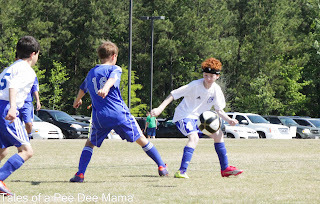 Since he received a concussion a few weeks ago, he has to wear the headgear when he plays. He's not real fond of it, but he wears it without complaint. Most people just think it's a headband.